Lean turkey patties with honey balsamic mushrooms, caramelized onions and oozing melty provolone cheese. Is it barbecue time yet?? Aaaaand then of course we have July 4th. Which just screams good times and fireworks and yummy drinks, oh.. and barbecue…tons of it. Tons of hotdogs (nom), ribs (gimme)…the list goes on. So I thought that in spirit of this wonderful holiday being around the corner, I would use this opportunity to whip out one of my favorite healthy substitutes – turkey sliders. They’re absolutely delicious, especially when topped with juicy balsamic mushrooms and sweet caramelized onions. Making these lovelies is actually very simple. Please don’t let the ingredients list intimidate you, most of these are just seasonings to ensure optimal nomness. They’re easy and perf for your family barbecue, friends. In a small bowl, combine garlic powder, almond milk and honey balsamic vinegar, set aside. In a medium saucepan, melt 1 tablespoon of vegetable oil spread over medium heat. Add mushrooms and saute until slightly tender. Add balsamic vinegar sauce and reduce to medium heat. Allow mushrooms to simmer on low heat for around 10 minutes to really allow them to soak up the flavor before removing from heat. Spray a separate saucepan with cooking spray and saute onions on medium heat. Once onions are slightly browned, add honey and continue to saute until they are caramelized - approx 3-5 minutes. In a large bowl, add ground turkey, diced shallot, egg white, Worcestershire sauce, oregano, paprika, sea salt and black pepper. Using your hands, combine ingredients (don't be afraid to get your hands messy...really get all up in there). Spray a medium sized saucepan with cooking spray and turn up to medium heat. Form turkey into 10, small sized patties and cook them in two batches, flipping over once one side is brown. Approximately 5 minutes before you are ready to remove patties from heat, add 1/2 slice of provolone cheese to the top of each patty and allow it to melt. 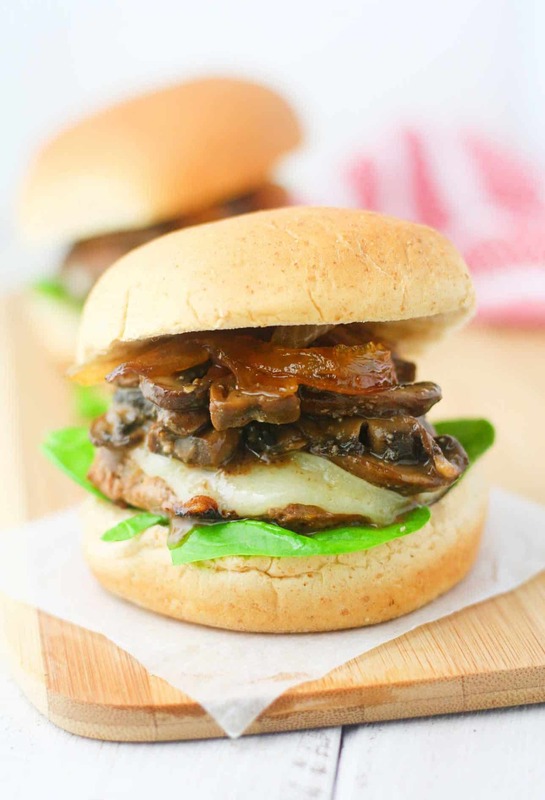 Place a little spinach on each slider bun and top with a turkey patty, mushrooms and caramelized onions.